Apple released a new version of iTunes at the "Beat Goes On" special media event today, allowing users to make their own ringtones & sync directly to the iphone for $.99 in addition to the cost of the song. 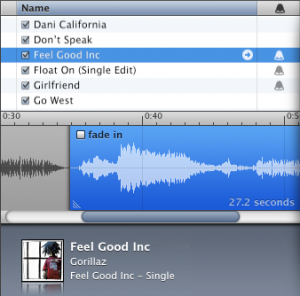 The user is allowed to pick any 30 second selection from a song, with iTunes automatically creating fade-in and -out for the ringtone. After agreeing to your selection, you can click the "buy" button and for 99 you have a ringtone. Only select songs are available to create ringtones from, with each usable track displaying a "bell" icon. The new version of iTunes should be available tonight but Ringtone support may lag.